Watch Lynne and Tim on CBS This Morning! Cook Like a Local in France, published by Countryman Press, is now available for pre-order. Charming travel stories, excellent recipes by extraordinary chef Deborah Scarborough, fifty beautiful photos, and much more will encourage you to cook and eat like a local Frenchman wherever you are. Order now and be the hippest person in your neighborhood! 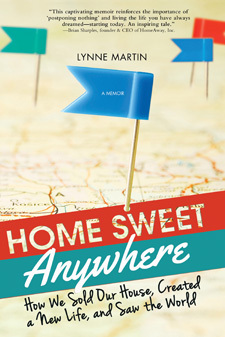 Order Home Sweet Anywhere, read by author Lynne Martin at audible.com! Lynne Martin lives home free with her husband, novelist Tim Martin. They are nomadic retirees who travel with two suitcases, two computers, and the savvy to make a home almost anywhere. LYNNE BLOGS FOR THE HUFFINGTON POST! Five Rules For Choosing a Vacation RentalHow We Downsized 2,000 Sq. Ft. Into Two Rolling Duffles…Senior GypsiesRepositioning CruisesWaterloo Up Close & PersonalPack a Spice Rack in Your Suitcase! Lynne and Tim’s TV Debut!